he M2p.65xx series offers different versions of arbitrary waveform generators for PCI Express with a maximum output rate of 125 MS/s. These boards allow to generate freely definable waveforms on several channels synchronously. With one of the synchronization options the setup of synchronous multi channel systems is possible as well as the combination of arbitrary waveform generatora with digitizers of the M2p product family. 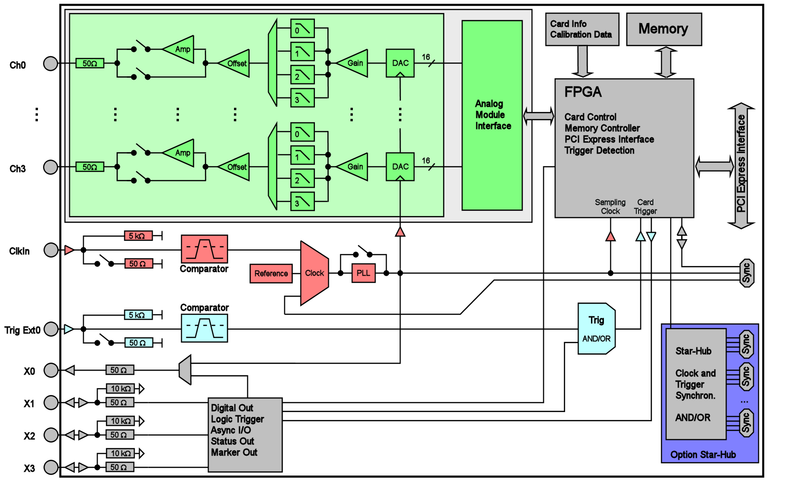 The 512 MSample on-board memory can be used as arbitrary waveform storage or as a FIFO buffer continuously stream data via the PCIe interface. Importantly, the high-resolution 16-bit DACs deliver four times the resolution than AWGs using older 14-bit technology. Additional synchronous digital channels (markers) can be replayed phase-stable with the analog data. When this mode is active up to four additional digital marker outputs can be used by reducing the analog resolution of the D/A converter. The product has one SMB connector for the analog channels, two SMB connectors for external clock and external trigger input and 4 MMCX connectors for multi purpose use.